In marketing, it is important to attract customers to your brand. If your brand does not stand out, there is no way that your company can drive sales up, as customers will not be enticed to try your brand. This is where Koikeya comes in! 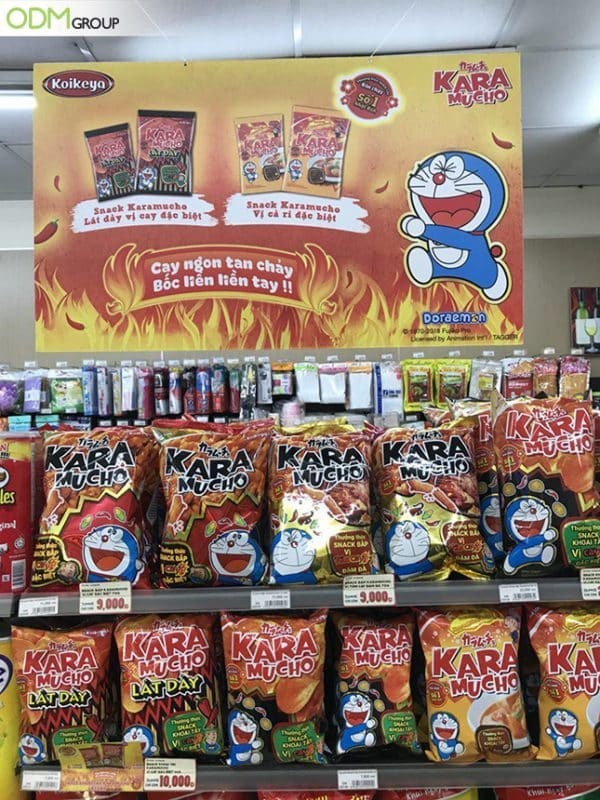 Koikeya, a Vietnamese snack company, successfully entices customers to its product through a hanging display sign, at the local Family Mart in Ho Chi Minh! It does this with a board that hangs from the walls, above a display with its snacks. In the promotional board, Koikeya also makes use of collaborations to promote its product. It does so through the use of the popular Doraemon cartoon, on its board and on the snacks. What do we like about Koikeya’s hanging display sign? Use of cartoon character: We like that Koikeya has used the Doraemon cartoon on its promotional board. The Doraemon cartoon has proven to be extremely popular, and Koikeya can leverage on this popularity to get people to try its snacks. This is because people would associate the cartoon with the snacks. This would therefore make for a great promotion for kids. Colours: We like that Koikeya chose to use the orange colour as the primary colour of the board. This would help to make its board more prominent, which further helps to attract customers to its snacks. So, why do we like the use of a hanging display sign? Visible: We like the use of such custom hanging signs as it is visible. When entering the store, the first thing that the customer will see would be the board. This helps bring attention away from the competitors, and to your brand and product. Cost-Effective: Such a sign is also good, as it is easy to make, and is a practical advertising option. This means that your company will be certainly be able to save more, whilst creating an impactful in-store presence. Customizable: A hanging display sign is also easily customizable as they are usually made out of corrugated cardboard, which is a very versatile material. You can cut and shape them any way you want to with much ease. Likewise, installation is hassle-free. Remember, aside from promotional boards, there are many other promotional tools that your company can use to boost its brand. These include in-pack offers, on-pack offers, and complimentary gift with purchase. Furthermore, you can use many of these promotions together, which would help to further boost your brand. Could the use of premium displays help your company to improve sales? If so, ODM can certainly help! Feel free to contact us today! We specialize in design, manufacturing, and shipping! With us, you can ensure an easy and fast process of promotional products for your company! Here is a look at some other interesting blogs! Cool POS Display by Nescafe! See how this bespoke shape helped in shaping how the brand is perceived. Great use of LED advertising boards at the local Vietnamese VinMart! Certainly attracts customers. Very cool life sized promotional board by Samsung! Learn why a standee is a good investment.